The Mobile Documents module allows users to track documents received from the mobile application EmsowMobile and attach them to studies or services. Note: It depends on the document type whether the document should be attached to a study or a service. For example, consent forms are attached to services whereas tech sheets are attached to studies. Here you can see the list of documents arranged in several columns: ID, Accession No, Type, Date of receipt, Attached to, Attachment date, Attached by, and Actions. The last column, Actions, contains two buttons for attaching and removing documents: . You can click on a document type in the Type column to open the file preview. The Attach button allows users to attach documents to studies/services. In the drop-down menu, you can choose to automatically attach selected or all documents, or you can attach documents manually. 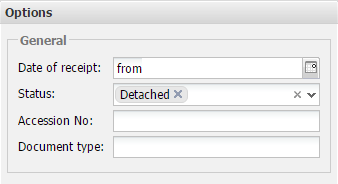 To detach documents, select a record and click the Detach button. Use the Remove button to remove documents. You can search services/studies by patient information: Last name, First name, Date of Birth or Patient ID. Search by service information is also available: Date, Service ID or Accession number. 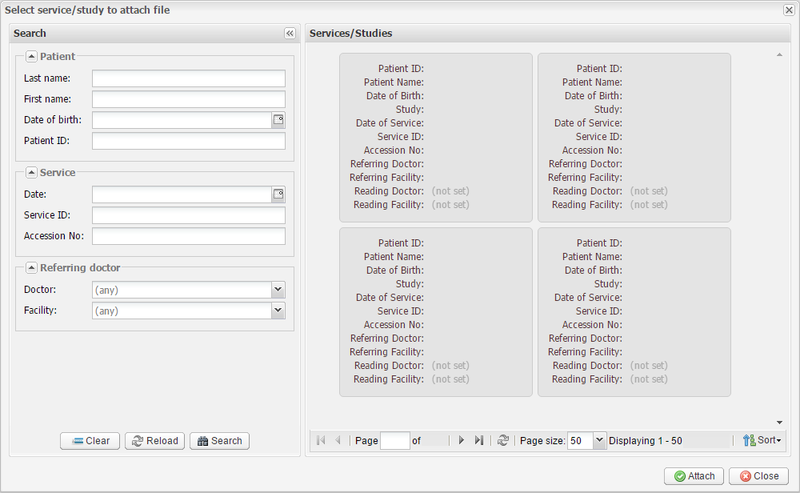 The last section allows users to search services and studies by Referring doctor or Facility. Click Attach to attach the documents or Close to quit without saving.